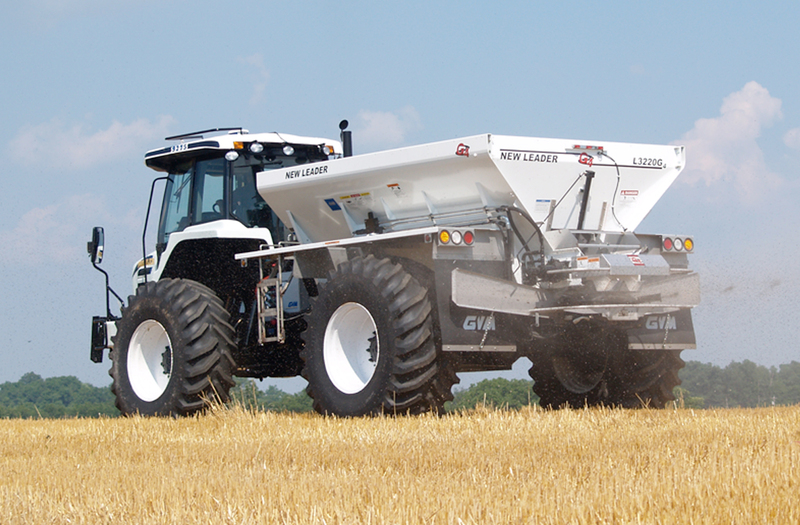 Ideal for fertilizer or ag lime, the New Leader® L3220G4 features a large capacity hopper that can accommodate a MultApplier. Its 30 inch wide conveyor system allows operators to broadcast fertilizer from 75 lb per acre up to 3 tons per acre of ag lime while consistently achieving spread patterns with swath widths from 60 to 105 feet with fertilizer and up to 60 feet with ag lime. The heavy-duty #4 belt-over-chain conveyor effectively spreads materials and minimizes bridging. An easy-to-access conveyor drive shaft and bearing make maintenance and tension adjustment simple. Increase your return on investment even more with the MultApplier. The L3220G4 with the MultApplier insert is a two-bin system with independent conveyors that allows operators to simultaneously apply two products at pre-determined or variable rates. Remove the MultApplier, and the main hopper may be used for single product application of fertilizer or lime. Available in 304 or painted 409 stainless steel, the L3220G4 is a great choice for operators that want to maximize payload and / or efficiency with a single axle truck.